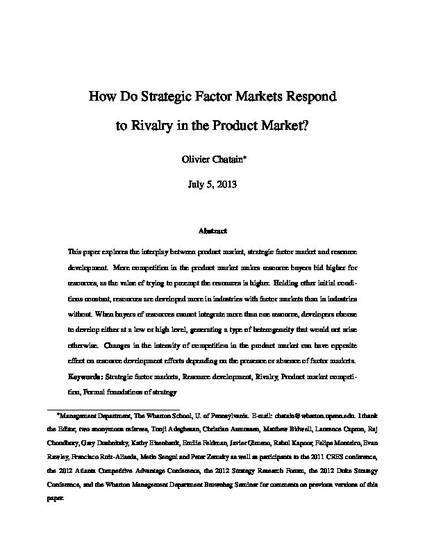 How Do Strategic Factor Markets Respond to Rivalry in the Product Market? This paper explores the interplay between product market, strategic factor market and resource development. More competition in the product market makes resource buyers bid higher for resources, as the value of trying to preempt the resources is higher. Holding other initial conditions constant, resources are developed more in industries with factor markets than in industries without. When buyers of resources cannot integrate more than one resource, developers choose to develop either at a low or high level, generating a type of heterogeneity that would not arise otherwise. Changes in the intensity of competition in the product market can have opposite effect on resource development efforts depending on the presence or absence of factor markets.